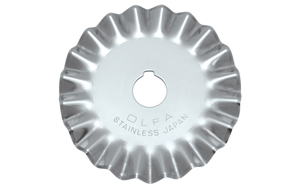 OLFA Blades PIB45-1 Model 9546 Is The Replacement pinking blade for the 45mm rotary cutter RTY-2/DX. This blade is made of stainless steel for durability. Each blade is a razor sharp blade. Designed to place "teeth" on the edge of fabric to reduce raveling. Very popular with crafts and memory book development as it provides a decorative edge. Also great for use with Polar Fleece! 1 blade per pack. 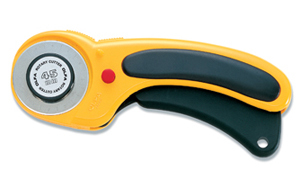 This blade is perfect for general quilting, sewing and craft projects. Can be used in industrial applications.